When you make plans to visit Destin, you'll have countless ways to explore this coastal spot in Florida. One of the most popular ways is by pontoon boat. Having access to your own boat, even if just for a day, means being able to explore the hidden gems that not many tourists ever get the chance to see on their own. Here are five spots you’ll want to visit once you’ve rented a pontoon. Destin Harbor is a stunning place worth exploring on your trip. Many travelers overlook the appeal of the harbor, not realizing it offers a lot of fun and excitement. 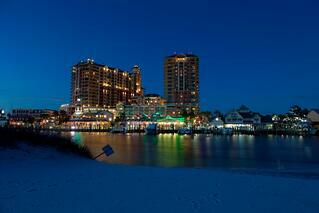 To start, Destin Harbor boasts incredible views and is one of the top spots in Destin to catch the sunset. There are also a lot of restaurants at and near the harbor. Be sure to check out their fresh catches of the day hauled in by local anglers. Destin offers some of the finest seafood you’ll find in Florida. You might end up in Destin Harbor if you're planning a boat tour or a boat rental. Many of the boats in and around Destin are docked at the harbor, making it a very convenient pick-up and drop-off location for travelers. Of all the places that are worth exploring in Destin, Crab Island is probably the most unique and the most talked-about of all. As the name suggests, Crab Island used to be an island, but now is a waist-deep underwater sandbar located just a few minutes from Destin Harbor. Anchor your pontoon boat rental in the shallow water and walk around to enjoy all the activities available at this popular destination. While Crab Island is stunning, it is more than just scenery that attracts visitors. It is the happening spot in Destin for much of the year as boaters enjoy floating food vendors, live music, watersports activities, and more. Just over a half mile long, the Destin Harbor Boardwalk runs right along the water and close to the harbor itself. If long walks on the sandy coast aren't comfortable, then switching it up to the boardwalk lets you cover more ground and still enjoy the scenery. There are lots of shops and eateries alongside the boardwalk. This makes it the ideal place to stroll. From the boardwalk, you can see the Destin charter fleet, which is the largest charter fleet in the world, bring in their daily catch. Also, you can see a huge variety of some of the most spectacular boats on the Emerald Coast including, sport fishers, yachts, and cruisers plus a wide variety of small craft including pontoons, center consoles, and deckboats. Sip drinks at sunset, or shop for the best souvenirs of your beach vacation. If you're in Destin to do any fishing, then you'll definitely want to spend some time in Choctawhatchee Bay. Not only is the bay beautiful, offering amazing views of the coast, but it is a veritable treasure trove for anglers. Some of the most common fish caught in Choctawhatchee Bay include mullet, flounder and speckled trout. Choctawhatchee Bay also happens to be one of the best places in Destin to see dolphins. While there is no guarantee when it comes to nature and wildlife, most people who rent pontoon boats and head out into the bay will spot dolphins at some point during the day. Joe's Bayou is a small coastal inlet that forms part of Choctawhatchee Bay. While it is used most commonly as a boat ramp for locals, it can be a fun place to check out with your pontoon boat rental. Along the coastline of Joe’s Bayou are some of the most spectacular homes in Destin. If you have a shallow draft boat like a pontoon, you can get closer to the houses for a better view. Whether you want to check out one of these hotspots—or all five—while you’re vacationing in Destin, a pontoon boat rental adds to the fun. At Double Fun Watersports, we can help make your vacation an unparalleled success. Check out our double-decker pontoons with two water-powered slides. You’ll soon see why they are the most popular pontoon rentals in Destin.